WordPress is one of the top Website development, blogging and CMS platforms around the world. TechCrunch, BBC America, Mashable, The New Yorker, and Variety are a few of the major brands and businesses whose websites are WordPress based. You don’t need to be a famous brand or multi-million dollar company to build a site with WordPress. It’s fairly easy to use, and there are many excellent themes available to create your Website. My standard go to themes come from StudioPress Themes for WordPress. However, there are other excellent themes out there. You can search for themes on Themeforest, where all themes are rated by users, such as the Avada theme. 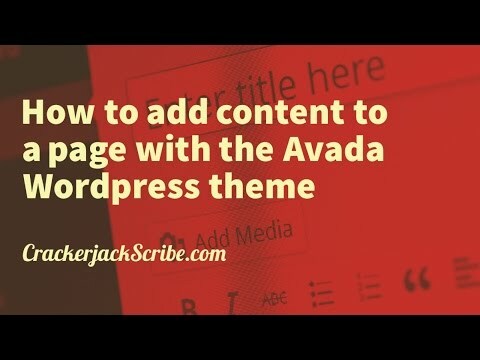 Avada for WordPress is a super multi-functional theme, with many build and design elements. The theme is great for any type of business Website, as well as real estate Websites. Coupled with an IDX service, you can create a beautiful, multi-functional real estate Website with Avada. Avada gives you the ability to build virtually any design style. In this video I show you how to add and edit content to a page using the Fusion Builder by Avada. What do you think? Did this tutorial help? Let me know in the comments box why or why not, or send me a message on what else you’d like to learn. Some links in this post are affiliate links. I never recommend products I don’t believe in.